The House will soon vote on their transportation bill that would eliminate dedicated funding for transit, eliminate the money that makes dangerous streets and roads safer for people on foot or bike, and do far too little to fix our bridges and roads. We need to send a message loud and clear that the House must scrap this bad bill and start over. Make a phone call today. Enter your zip code below to find your legislator and their phone number. Dial the number. Then leave this message below with whomever answers the phone, or you can ask to speak to the legislative associate who handles transportation and leave the message. Hi, my name is [NAME] and I live in [PLACE]. 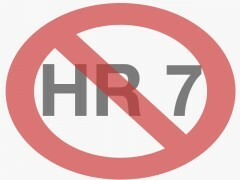 I’m calling to ask Representative [NAME] to vote “NO” on HR 7, the American Energy and Infrastructure Jobs Act. This bill would eliminate dedicated funding for public transportation and deprive my community of the tiny amount of funding that helps make our dangerous streets and roads safer for children and others on foot or bicycle. It does not do enough to fix our bridges and roads or provide people more options for getting around. It also does too little to put Americans back to work at this difficult time and create the jobs we desperately need. We desperately do need an updated federal transportation bill, but this proposal advanced by the House is not it.